When chiles reach their piquant peak, it is a sure sign of late summer. Hot peppers need a long, warm growing period during which they develop capsaicin, the chemical compound responsible for their spiciness. The production of capsaicin is a trait that probably evolved to discourage mammals from eating the fruits. 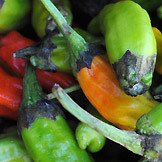 In the wild, birds, which are attracted to peppers’ bright colors but unaffected by their heat, generally spread their seeds. Despite the chile’s peppery pursuit to deter us, humans are pleased by their pungency. In fact, we have been very effective distributors of pepper seed. Capsicums are native to the Americas and were one of the first crops to be domesticated here thousands of years ago. After Columbus was introduced to the pepper, he brought its seeds to Spain; the crop subsequently made its way to the rest of Europe, Southeast Asia and India. Today, peppers pervade many cultures’ cuisines in various forms. Chile powder is one of the world’s most popular spices. The piquancy of peppers is measured using Scoville heat units, named after the man who first invented a way to gauge capsaicin content. On the scale, bell peppers rate zero, jalapeños around 5,000, and Habaneros around 500,000. Pepper spray, the active ingredient of which is a capsaicinoid compound, rates 5,000,000 units. In the United States, peppers with low Scoville ratings are more popular crops than their fiery relatives, but hotter peppers seem to be gaining employment in our culinary culture.